Saving a tooth is of the utmost importance to a dentist. Tooth extraction is a last resort to help maintain good oral hygiene. 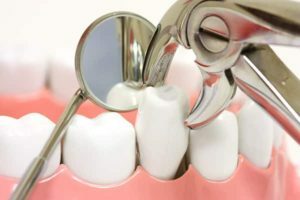 When tooth extraction is necessary, it means a dentist has taken all the measures they can to protect you from further damage but must remove existing issues to prevent further harm. When does someone need a tooth extraction? Tooth extraction can be made necessary for several reasons. However, if a tooth extraction is scheduled, it means there is irreparable damage. This is often caused by gum disease. A dentist will be sure to conduct a full examination before offering a tooth extraction. What can I expect from a tooth extraction? Before removing a tooth, your dentist will apply a local anesthetic. If there are several teeth being removed in one appointment, a general anesthetic may be used instead. The tooth will then be removed, and you may require stitches. If you discussed an implant, denture, or bridge before your operation, that can be placed. After surgery, your dentist will advise you on post-care. This will typically involve warm salt water rinses a day after surgery, as well as changing gauze pads. You will also be informed about dietary restrictions. If you think a tooth extraction may be your next step to good dental hygiene, schedule an appointment with our experienced dentist at Country Isles Dental. We can advise you about your options.